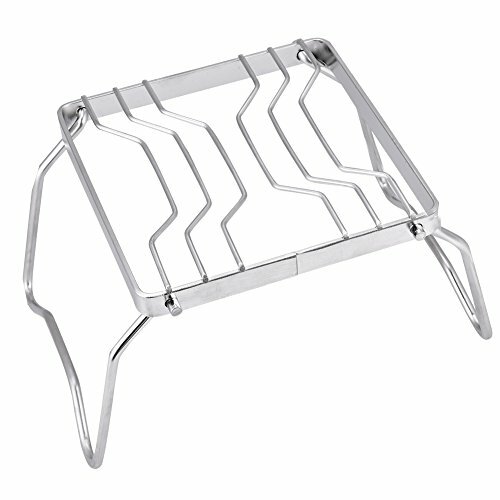 This folding grill is ideal for cooking over the edge of a campfire,or you can fit a few burgers,sausages in kettle for the morning brew.You can use this bracket to use larger containers to make food, such as stewed chicken,soup and so on,which is made of durable and heat-resistant stainless steel,whether it's a pressure cooker,a stainless steel pan,or a roasting pan. 1.HIGH QUALITY MATERIAL:The fire grill is made of durable and heat-resistant stainless steel,whether it's a pressure cooker,a stainless steel pan,or a roasting pan, it works. 2.CONVENIENT TO USE:This folding grill is ideal for cooking over the edge of a campfire,or you can fit a few burgers,sausages in kettle for the morning brew. 3.LARGE SPACE:You can use this bracket to use larger containers to make food,such as stewed chicken,soup and so on. 4.STABLE AND STURDY:The stability of the bracket avoids the problem of causing food spilling by using an ultra-small grill. 5.COLLAPSIBLE:The grill can fold it down to flat so it is easily to be packed into a backpack,so you can take it to your backpack party. The product is only the camp fire bracket. Does not include other things (such as the burner, the hanging pot, the gas tank, etc). HIGH QUALITY MATERIAL:The fire grill is made of durable and heat-resistant stainless steel, whether it's a pressure cooker,a stainless steel pan,or a roasting pan, it works. STABLE AND STURDY:The stability of the bracket avoids the problem of causing food spilling by using an ultra-small grill. LARGE SPACE:You can use this bracket to use larger containers to make food,such as stewed chicken,soup and so on. CONVENIENT TO USE:This folding grill is ideal for cooking over the edge of a campfire,or you can fit a few burgers,sausages in kettle for the morning brew. COLLAPSIBLE:The grill can fold it down to flat so it is easily to be packed into a backpack,so you can take it to your backpack party. Propane Fuel Cylinders, 4 pk./16 oz.